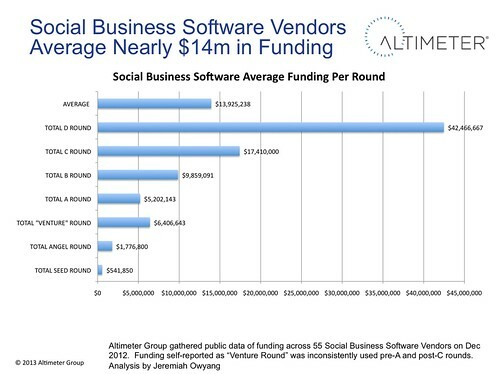 Social Business Software vendors (Startups that offer social technology software and solutions for corporations to use to interact with employees, customers, and partners) have raised on average $14m with the most common round being an A-Round at $5.2m. A few vendors have received large D-Rounds, however most are receiving $5-10m rounds from a series of investors. Brands must ask vendors at least 5 questions on who and how this money is and will be used, to understand the strategy before buying. As an Industry Analyst, I look at The Three Spheres of Web Strategy of the market to understand it: 1) Consumer behavior (who brands want to reach 2) Brand appetite (customers of software vendors) 3) Technology providers (those who aid brands, like these players). On a weekly basis I interact with Brands, Media, Software Vendors, and Media to exchange information. I wanted to bring some hard data to the conversation on the funding aspect which fits in the technology sphere. Above: Figure 1 indicates that across these 55 startups, the total funding amount was $765. Please read method and scope below to understand this is not the full space. 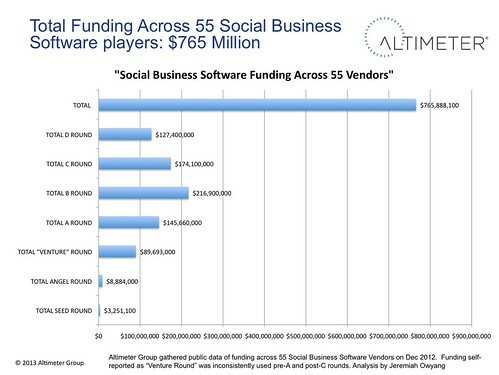 Above: Figure 2 indicates that on average, Social Business Software vendors have raised $14m in funding. Above: Figure 3 indicates that on average, the average funded round is the A-Round. After probing the data for hours, I found some interesting trends in the market worth notating. Total Funding across these 55 active vendors is $765m. with most funding occurring in last few years however some vendors like Lithium have been present for over a decade. This is a relatively small amount of funding in the VC space, as some giants like Andreessen Horowitz are managing over $1b for a fund, and my finger to the air estimate is that many a Sand Hill VC average around $400m per fund in my space. Funding is significantly smaller compared to consumer cousins. For comparison, Facebook received a total of $2.2b of funding, and Groupon with $1.14b and Zynga with $860m. I’d argue that the returns on B2B players revenue (on a percentage basis) may be higher. While bluechipper Facebook is on track for a potential $4b runrate, but Zynga and Groupon have questionable destinies. Furthermore, the startup costs for Social Business Software vendors is low with open software, cloud infrastructure, and sometimes virtual workforces. On average, vendors raised $14m across all rounds. On average, these startups took a relatively modest amount of revenue over the lifetime of their companies. While the scope of startups includes both established and early stage, $14m is a relatively modest amount when software salaries, the high rent in coastal cities, and compared to consumer startup giant funding, is relatively small. Many vendors boast annual revenue streams of about $5m-$10m of SaaS best repeatable revenues in my interactions over past 5 years, with exceptions on both ends. 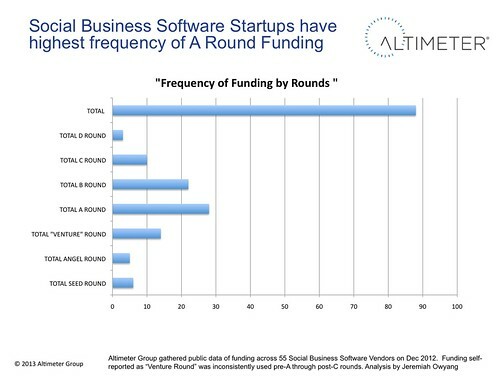 The A-Round is most commonly funded round. The A-Round investments lead the back, 8 of the total 88 investment events (33%) were at the A-Round at $5.2m. This crucial round demonstrates to the investors that they’ve received corporate traction in an addressable market, and are ready for faster growth to keep up. For further momentum, the most common round was a B-Round which comprises of 22 of 88 events, (25%). Although there are fewer D rounds, the average value exceeded $42m, a goliath size readying the company for a material event. D-Rounds lead the largest portion of overall funding dollars. This later stage fund is often ‘double down’ money by VCs who look for companies that have proven their mettle and are ready for expansion at a rapid pace. (product, sales, territory, aboard offices and M&A), or are preparing for sale to third parties (Salesforce, Oracle, IBM, Adobe have rapidly entered this space). In some cases, late stage dollars increase overall value of software firm to raise valuation amounts before a material event. Confusion over terminology of funds makes tabulating not clear. The amorphous term “Venture Round” spanned funding that was pre-A and even post-C (like Gigya). In some cases, some vendors received only 1 round of funding and titled it Venture Round, which could be assumed as A. In some cases Venture Round was an extension of a A-C round (Gigya’s latest large round was listed as a venture round, post-C), and while that data is likely listed in the S-1, I chose not to dive into it to dissect for purposes of this industry level data. Brands are making million dollar commitments to these software vendors, and often their careers, and quality of worklife will pin on choosing the right vendors. Beyond features and functions, buyers must pay attention to the root of funding as it shows financial stability, ability to grow, and credibility from third party investors who also believe in the company. As vendors pitch brands their software and services, it’s important to carefully pay attention to the slide on funding, as it helps to give an anchor point on where the firm has come from, and how fast they may grow in the future. How much have you raised and from whom? What other software companies are in the VCs portfolio are related? Find out who has invested and look at their websites for a track record of successful investing in enterprise software. They’re often key advisors, or make connections for the startup, you’ll want to know every angle. What is that money going to be used for? How have you used it in the past? How will this help customers? As you look under the hood, find out how they’ve used investor dollars in the past, and look for key acceleration points, if you don’t see this, raise a red flag. For recent funding, ask how they’ll strategically use this. Do these investors advise your company on a frequent basis? Are they on the board? Ask specifically what each round was used for, and what were the business impacts. As firms raise new money, have a frank discussion on how they’ll use it going forward. So you raised a big ton of money, are you going to sell the company? If a vendor has raised significant money as a later stage, have a frank discussion on their exit, while IPO is no longer attractive in today’s market conditions, we’ve seen a number of acquisitions occur which will impact customers. You haven’t raised much at all, why? If a company has not raised much funding, find out why and how. Question if they’re going to match growth rates with competitors who have cash on hand to do expansions and potentially purchases of competitors. In some cases, vendors have inability to raise much money, due to VCs passing up on the deal, due to issues, it’s key you track this. First, we developed a data set of vendors based on feedback from my initial vendor set who we hear about from clients, press, and VCs, as well as took in input from Altimeter’s research team. Then, I commissioned a researcher to conduct public research to collect all this data with sources and I vetted data content. This research was conducted across 55 social vendors spanning 6 sub-categories including: Social Media Management Systems (like Sprinklr, Hootsuite, Buddy Media), Social Commerce (Bazaarvoice), Social Integration (Gigya, Janrain, Echo), 2 Gamfication (Badgeville, Bunchball), Community Platforms (Lithium), Listening (Radian6, Social Bakers). A majority of the sample set are SMMS vendors who are the most active funded at this time. The time tables on these funding notes typically span 1-5 years, but there are records of some longer term vendors that were included that have been funded over 10 years ago. This study does not include funding from consumer startups Facebook, Twitter, Groupon, Zynga who all leave these other vendors dwarfed with total funds amassed. This is only a sample of 55 vendors out of 100s, the total sample size was intentionally limited vendors on my ‘coverage radar’. I’d like to thank the following people for their assistance: Jennifer Jones for her guidance on the VC landscape, Nadim Hossain (seasoned Social Business Exec), Blake Bartlett (Battery Ventures), Andrew Jones (Altimeter Researcher), Christine Tran (Altimeter Researcher), Julie A for data research. Funding across category types, top VCs funding Social Business Space, profile of the top 5 Funded Social Business Software startups. Please check out my full body of research to learn more about my coverage. Community managers are the most powerful group on the internet, they manage the largest social accounts –but ironically are hidden behind the scenes. It’s that time of year again, to send a kind note to the Community Managers who have helped your company, or you as a customer using social media channels. Like System Admin day, or Administrative Professionals day, we take one day a year to thank and appreciate those who are helping us connect to customers in a sometimes thankless job. While no gifts are required, the purpose is to give a genuine thank to the never ending, often thankless job of supporting customers and balancing internal stakeholders, a tough balance when the whole world is watching. Whether you’re a community manager at a tiny startup in India, or the head of community at Adobe (hola Rachel Lux) or community manager at an agency like Edelman representing your clients, now’s your time to shine. Or, if you’re a community manager, write about why you are doing this role and what drives you to get up every morning to do your job. Over the years, this even has become a global phenomenon, as people organize in person events, workshops, conferences, cocktails, dinners and publish digital artifacts. I’ll cross link to all who are planning an event (real world or online) in the hopes or coordinating as a central place. My Community Manager did a video discussing this upcoming day. 10 cheers for Community Managers everywhere! Another in Finland in Tampere, in Finnish. Oracle (Vitrue) has created three videos of Community Managers, who are the finalists, watch in here, and learn about their position. They’ll be announcing the winner, on Jan 28th on Facebook. I’m one of the judges, and have given my feedback. I’m adding to this list, and sorting the list as the events are added to the CMAD twitter stream and in my comments below. Messaging is often the first thing prospects, investors and analysts see, so it’s important to focus on it as much as core capabilities as we’ve done in our research report which has been viewed 164k times on the vendor landscape. Over a year ago, I conducted the same exercise to compare the positioning of this same space, and wanted to compare the changes in the space based on data and then draw insights. This exercise was conducted in the mindset of the buyer (heuristic review as a social marketer and executive) using the following method: First, I built a list of vendor names, working with Altimeter’s Andrew Jones, then, I put myself in the place of the buyer and imagined their task of sorting through this new space and short listing it. Then, a researcher and I went to each website homepage to glean the keyword set, graph on worksheets and conduct data analysis. We looked at tag lines, slogans, keywords, browser title tags. After some data modeling, here’s the positioning each of the 27 vendors, including: Actiance, Argyle, Awareness Networks, Buddy Media (Salesforce), Context Optional (Adobe Social), ConverSocial, CoTweet (Exact Target), Engage Sciences, Expion, FALCON Social, Friend2Friend, HearSay Social, Hootsuite, HYFN8, Liveworld, Shoutlet, SocialVolt, Spredfast, Sprinklr, SproutSocial, Syncapse, Targeted Group, TigerLily, Tracx, UberVU, Vitrue (Oracle) and WildFire (Google). Here’s a list of all the positioning statements. Two of the positioning statements had vendor names included in them, which I changed below to “vendor”. It’s time to take the guesswork out of social media. Vendor is a user content management company providing technology and services to help brands scale social media. Social media management for exceptional companies. Above: Even after over a year, the market still focuses on keyword terms like Social Marketing, SMMS there was increased deviation in market. Last time 40% used SMMS (10/25) or Social Marketing (10/25 or 40%) as the highest frequency. This year, 8/27 used Social Marketing in taglines, which is just about 30%. What was interesting is that we’re seeing some unique identifiers used by just a few vendors, showing that they’re slight differentiation from player to player. 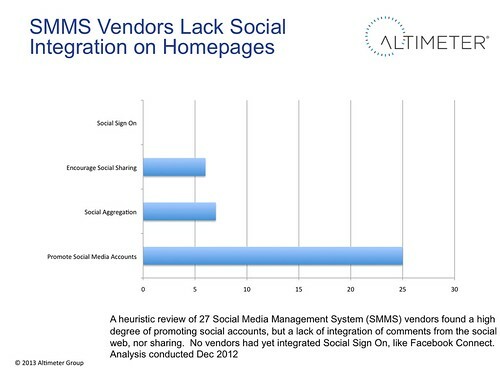 Above: Ironically, most of these SMMS vendors were not integrating social onto their own corporate websites. While 25 of the 27 would link away and promote their social media accounts, only 7 were aggregating discussions from their own market place and a few were explicitly encouraging sharing of content. None had Social Sign On (SSO) which I consider is a sign of social maturity. 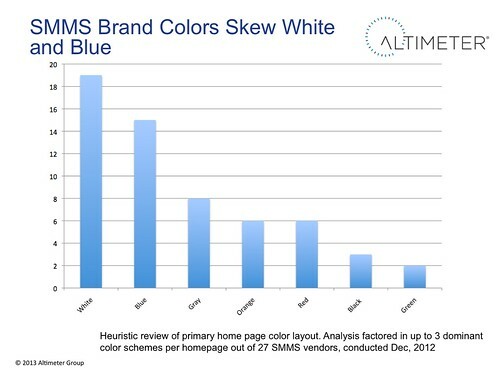 Above While not an indicator of much, there was a strong preference for white and blue brand colors. Those that didn’t take to this could potentially stand out if all logos were listed on one page. In my experience, blue tends to be a dominant color in tech field, so there isn’t that much of a surprise. There’s a number of smaller, interesting findings that I wanted to include from the study. We found that 21 of the 27 vendors had business value messaging (offers to improve customer value, business value) and 8 of the 27 had feature and function capability offerings. Tracx and Falcon were able to pull off both at same time. In the last study, SMB was marketed as a keyword set, but was not in this current finding set. We found that Syncapse and Hearsay had a much larger keyword set indicating that they have wider capabilities. Our research in previous reports correlated with this as Syncapse scored strong in multiple categories and Hearsay has a strong foothold in Legal, Risk, Compliance, and Financial Services, a unique market to manage. The research team was confused by CoTweet’s lack of positioning on the page, and would expect that prospects would be left scratching their head and either look for additional information, or leave. Sprinklr had a unique message “Social@Scale” which is both plays to their identifiable capabilities, unique, and marketable beyond a campy slogan. For kicks, there are fewer than expected animal logos, with Hootsuite owl, Tracx primate, Tigerlily grinning feline, and a wing from Falcon. Had Seesmic been around, we would have added a crook eyed Raccoon. Spelling-wise, this market is still plagued with oddly spelled vendors names. I find myself frequently have to tell clients how to correctly spell it out, slowing down inquiry calls. This includes vendors like HYFN8, Sprinklr, Spredfast, Tracx, UberVU and Vitrue (Oracle). 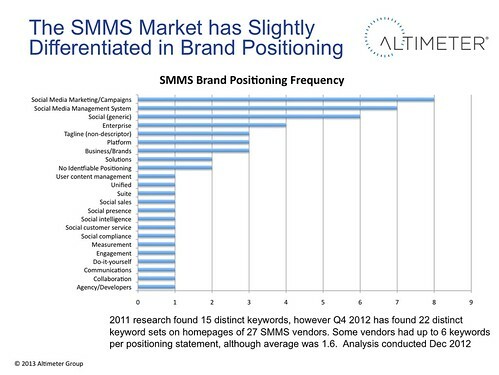 Overall the market is still pinning on social marketing and SMMS as a category. There was slight market differentiation matching the deviation as the market continues to mature. Some vendors are finding some unique categories to market their offerings, while some are still going broad to appeal to a larger set. Expect to see more M&A this coming spring as incumbent software vendors need to quickly get in the game, I’ll post more on this in future. Credits to third party researcher Julie George for the data collection via TaskRabbit.